Tuesday morning, I sat with a roomful of journalists at Apple as Steve Jobs introduced a redesigned iMac , as well as new versions of iLife and iWork. I took Jobs’ proclamation that all products were “shipping today” with a grain of salt, since that usually means products begin shipping out to stores on that date and aren’t always available to customers until a few days later. To my surprise, by the time I got back to the office, the Macworld Lab had already procured all three of the standard iMac configurations. As the person who’ll be writing the iMac review later this week, I snagged one from the lab and (after wolfing down a salad for lunch) unpacked it at my desk. Placing the 20-inch model in front of me, the shape was very familiar but the design was quite different. The aluminum body looks like the Mac Pro and MacBook Pro—surely not a happy accident. And instead of the same color all the way around the front and the screen, the new iMac has a black border about one inch thick all around the screen. The effect is such that it makes the screen look larger than the same size glass on the previous model. The silvery Apple logo has been replaced by the same black that borders the screen. The other noticeable different is the glossy screen, similar to that on the MacBook line. 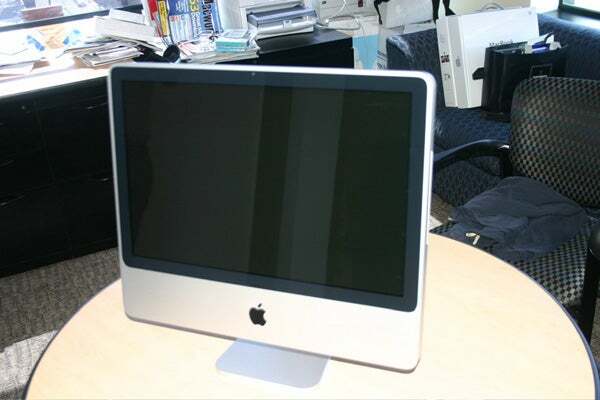 It’s highly reflective and makes the iMac look a lot like an LCD television. (The darker colors and black border don’t hurt either in that regard.) Apple even includes a black chamois (a larger version of the one in the iPhone box) for cleaning off the smudges that will surely appear on the nice display. Turning on the iMac gave me the chance to see the bright, glossy display in action, which looked more pleasing than the previous iMacs. The built-in iSight camera is the same black color as the ring around the screen in which it sits—that, combined with its new round shape, makes it blend in very well instead of being obvious as with the older iMac. Inside the box, I found the familiar Mighty Mouse, as well as the completely alien new keyboard. It shares the same brushed metallic look of the iMac, and looks like it was lifted from a MacBook and dropped onto a piece of very thin aluminum. 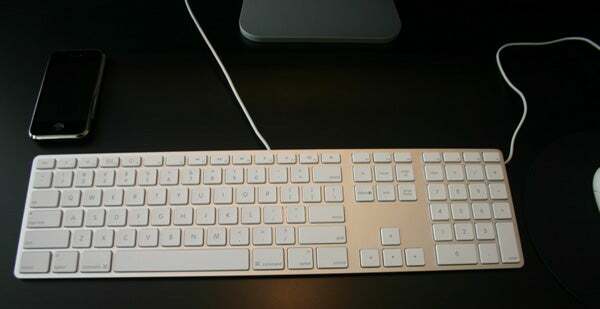 The keys are the same design as those on Apple’s newest laptops, but there are now Exposé, Dashboard, and iTunes media control functions on keys that double as function keys. There’s also a full keypad. The front edge of the keyboard itself stands only about one-third of an inch above your desk, making it blend in more than any other Apple keyboard to date. I could go on and on, but to be fair, I’ll give it a few days before the full review. Make sure to check back on Macworld.com for the review plus the results of the Lab’s tests. In the meantime, visit our photo gallery to see more iMac and iLife images.